Facilitating the development of better medicines for diabetes, obesity and cardiovascular disease is a key driver behind some painstaking research at the Maurice Wilkins Centre to unlock a molecular blueprint. Up to 40 per cent of marketed drugs target so-called G protein-coupled receptors (GPCRs) on the outside of their target cells. The natural hormone amylin, and an important diabetes medication called pramlintide that mimics amylin, also act through a GPCR. The amylin receptors consist of a sequence of amino acids which Debbie’s Maurice Wilkins Centre-funded PhD student Joseph Gingell has been modifying one at a time, using a molecular technique called site-directed mutagenesis. Signalling is then measured to determine which amino acids are important for receptor function. “We can use that information to design modified forms of amylin that interact with the receptor and could then be used as drugs” says Joseph. Maurice Wilkins Centre investigators are focusing their attention on amylin (pictured above) - a well-known naturally occurring hormone and established target for diabetes drug treatment. 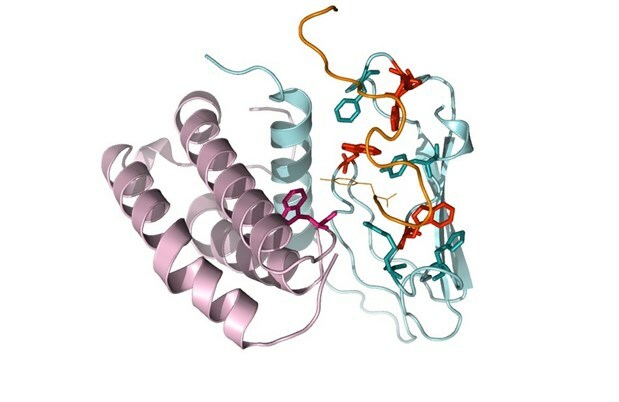 Unlocking the molecular secrets of the amylin receptor has taken years of research which Debbie says has been made all the more challenging by the presence of ‘accessory’ proteins – small “clip-on” proteins that modify the GPCR’s function, rather unimaginatively called Receptor Activity-Modifying Proteins or RAMPs. Joseph’s work has helped unravel what part of the receptor is important for amylin interactions and, despite previous assumptions, he has also shown that the RAMPs don’t always directly affect how the hormone binds. Her lab is also collaborating with chemists and molecular computational modellers to develop new drugs based on the amylin template. This work has already produced more potent molecules than the existing amylin-like drug pramlintide. “We’re feeding information on the fundamentals of how this natural hormone engages with this receptor directly into a drug development programme. So this is not just theory, it’s actually producing practical results here within the Maurice Wilkins Centre,” says Debbie.